The beautiful Croughton Church was built of local stone on the order of Geoffrey de Mandeville and consecrated around 1080 BC. Through the centuries and today the community as a whole is proud of its church and have worshipped and celebrated there for the full range of human and community purposes. Of particular historic interest is the east window about the alter in the Chancel designed by Sir Ninian Comper. 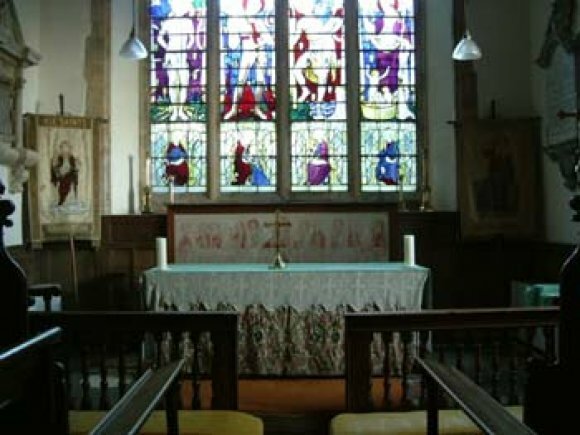 A particular feature of the church, are the wall paintings , probably painted between 1280 and 1300, and consequently plastered over at the Reformation. Re-discovered in 1921, they are in dire need of conservation. They are important to the history of English art, particularly for the completeness of the story cycles of the life of Christ and the Virgin. A number of 13th and early 14th century wall paintings have been restored – some of them rare. It is thought that many exist under the plaster yet to be revealed. The paintings are in the Nave are of national historic significance (see http://www.paintedchurch.org/croughpc.htm) . The Community has recently completed a major organ restoration project. The building is Grade 1 listed in the current list of buildings of special Architectural and Historic significance. Croughton War Memorial (in the grounds of All Saints Church) - commemorates the residents of Croughton who were killed or missing in World War I and World War II.